Nima Ghalichechian is the recipient of ISR's 2007 George Harhalakis Outstanding Systems Engineering Graduate Student Award. He was nominated by Associate Professor Reza Ghodssi (ECE/ISR), his faculty advisor. Nima obtained his Bachelor of Science in Electrical Engineering from the Amirkabir University of Technology in Tehran, Iran—one of the best engineering schools in that country. Nima’s research focuses on the development of next generation Power MEMS devices based on micro ball-bearing technology for miniature battery applications. It is an interdisciplinary project that involves design and modeling, materials characterization and process development as well as extensive device characterization and testing. The impact of Nima’s Ph.D. thesis is the use of micro-ball bearing technology in MEMS with an emphasis on 1) design of a novel electrostatically-driven rotary micro-motor, 2) process development, including the characterization of low-k dielectric materials and precision MEMS fabrication, and 3) microtribology and study of the long-term reliability of these devices. Nima has designed, modeled and tested the world’s FIRST rotary micro-motor supported on micro ball bearings. As part of this work, he has also designed a creative MEMS fabrication process flow as well as a comprehensive material characterization experiment to test the electrical properties of the low-k dielectric materials used in this micro-machine. Nima has had five journal publications, two as the first author, and twelve conference papers and presentations, either as the first or second author. His conference presentations have always received overwhelming attention from my colleagues. 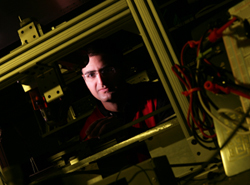 Nima was the co-recipient of the 2004 MEMS and NEMS (MN) Technical Group Best Graduate Student Paper Award, at the 51st AVS International Symposium and Exhibition. In June 2006, he gave one of the 24 oral presentations at one of the most prestigious MEMS conferences in the world, Solid-State Sensor, Actuator, and Microsystems Workshop. Nima was also the recipient of the prestigious 2006 AVS Graduate Research Award that is given only to a few selected students nationally.